The Most Lethal Sniper in US History. In 2014, Clint Eastwood released two films, and I suspect most thought the first - Jersey Boys - boasted the most commercial potential. While movie musicals don’t sell like they used to, 2008’s Mamma Mia! proved they can still move tickets. Based on a hugely successful Broadway production and given a prime summer release date, Jersey Boys seemed like the Eastwood flick most likely to make gobs of money. On the other hand, American Sniper barely got released in 2014 at all. It received a limited theatrical run to qualify for various awards, but it didn’t “go wide” until mid-January 2015, a time of year traditionally viewed as a dumping ground for movies with little chance of monetary success. So what happened? Jersey Boys basically flopped, as it made a meager $47 million US – and not much more overseas. Even with a relatively low $40 million budget, Boys probably lost money. On the other hand, even burdened with a crummy mid-January release date, Sniper turned into a smash. It took in almost $90 million during its opening weekend alone and went on to make $349 million in the US, a figure that allowed it to top Hunger Games and Guardians of the Galaxy as 2014’s biggest hit. That makes Sniper one of the least likely box office champions in a long time, and it’s easily Eastwood’s biggest financial success. 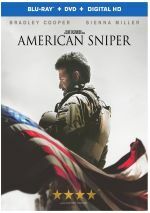 Based on a true story, Sniper introduces us to Navy SEAL Chris Kyle (Bradley Cooper). After a quick glimpse of Chris at work as a sniper in Iraq, we go back to his childhood and meet him as a boy (Cole Konis). We get a taste of his family life and see his youthful talent as a shooter. After that quick interlude, we encounter Kyle as a 30-year-old who seems aimless; he works as a rodeo rider but hasn’t really found his niche. When he learns about a late 1990s terrorist incident in the Middle East, he decides to join the military, and the recruiter steers him toward the SEALs. We follow Chris through his training and eventual deployment, where he earns a reputation as the greatest military sniper of all-time. We also see Chris’s relationship with Taya Studebaker (Sienna Miller), a woman he meets during training and romances/marries. That dynamic reflects a lot of the tension in Sniper, as we see the conflict between Chris’s sense of duty and his desire to enjoy a good family life. The former virtually always wins, as Chris seems to feel a need to “save the world”. He appears to believe that if he doesn’t act to protect his fellow soldiers, no one else will. This gives Sniper a bit of psychological depth, but not as much as it wants. The film telegraphs its theme early, as we watch a hamfisted lesson about “wolves and sheep” that Chris’s father (Ben Reed) instills in him. It’s this notion that seems to convince Chris he needs to ignore family responsibilities to serve what he deems to be the greater good. While I should applaud the filmmakers’ attempts at character/thematic depth, that side of Sniper doesn’t work especially well. The movie simply doesn’t give Chris’s civilian side enough exploration to satisfy. Whenever it digs into his time with Taya and his kids, it seems anxious to get back to the war zone. Perhaps that makes sense, as it appears to reflect Chris’s mindset. I don’t get the impression that this was the filmmakers’ rationale, though. I think they simply want to show Chris’s military career more than anything, and those are the scenes that become the most interesting. Really, Sniper works best when it ignores stabs at “meaning” and just becomes a basic war movie. We see Chris’s attempts to stop a foe known as “The Butcher” as well as his desire to find/stop his opposite number, a sniper known as “Mustafa”. Those moments bring the movie to life. Eastwood stages the military scenes in a lively, involving manner that creates a good sense of tension and drama. As a war flick, Sniper does well. I think if Sniper spent most of its time back in the USA and only occasionally offered glimpses of Chris’s military career, it could’ve achieved its story/character-related goals. However, with so much investment in war action, the movie lacks the running time to give us the depth it desires. None of this makes Sniper a bad movie, of course. 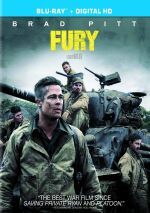 It still remains a lively experience, and despite its shallowness, it manages to become a passable exploration of the concept of “duty” and the way war impacts its participants. I just don’t think Sniper boasts the dimensionality it needs to become a great film. American Sniper appears in an aspect ratio of approximately 2.40:1 on this Blu-ray Disc. This became a strong presentation. At all times, sharpness seemed solid. The movie offered very good delineation, with nary a soft spot to be found. No signs of moiré effects or jagged edges materialized, and edge haloes failed to appear. I also didn’t see any print flaws. When the movie started, I actually exclaimed “whoa – green!” We find other hues as well – mainly orange/amber – but the teal/green dominated. While predictable, the transfer executed those hues well. Blacks looked dark and tight, while shadows looked smooth and clear. Everything about the image satisfied. Happily, the Atmos mix played back as Dolby TrueHD 7.1 for those of us with “antiquated” systems and it added strong involvement to the experience. With the level of bombast expected from a movie with many scenes of combat, the soundfield used the various speakers well. Obviously, battles proved the most involving, as they engulfed the viewer with the sounds of the setting. That side of things worked best, but other sequences also seemed quite good; even quieter sections placed the viewer in the action and consistently satisfied. Surround usage was pleasing throughout the film, as the back speakers bolstered the various settings well. Audio quality was also good. Speech appeared natural, and the lines never demonstrated intelligibility problems. Music was quite dynamic and lively, as the score showed excellent range and delineation. Effects were also bright and bold, with nice low-end to boot. Across the board, this was an excellent track that deserved a solid “A-”. Two bonus features show up here. One Soldier’s Story: The Journey of American Sniper lasts 31 minutes, four seconds. It includes notes from director Clint Eastwood, producers Rob Lorenz, Andrew Lazar and Peter Morgan, screenwriter Jason Hall, Chris Kyle’s widow Taya, senior military technical advisor James D. Dever, and actors Bradley Cooper, Sienna Miller, and Kevin Lacz. The program looks at the project’s roots and development, story/character areas, cast and performances, how Eastwood came to the film, locations, training and realism, and related topics. Despite some fluffy moments, “Story” delivers a fairly good look at the production, especially in terms of how it got to the screen. This turns into a satisfying piece. The Making of American Sniper runs 28 minutes, 35 seconds and features Cooper, Eastwood, Kyle, Hall, Lazar, Morgan, Lorenz, Miller, US Army veteran Chris Marvin, Iraq and Afghanistan Veterans of America CEO/founder Paul Rieckhoff, and retired Marine Jacob Schick. “Making” touches on the same topics as “Story”, though it gives us some different notes about those areas. A lot of it repeats from “Story”, though, and with a much more promotional tone, it proves less effective than its predecessor. The disc opens with ads for San Andreas and Mad Max: Fury Road. No trailer for Sniper shows up here. A second disc provides a DVD copy of Sniper. It lacks any of the Blu-ray’s extras. With some well-executed war sequences, American Sniper often becomes an engrossing experience. However, when it attempts more character depth, it tends to sputter, as it doesn't pull off those elements well. 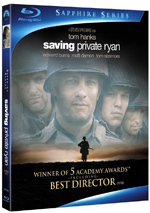 The Blu-ray brings us excellent picture and audio as well as two long featurettes. I think Sniper turns into a good movie but not one that veers toward greatness.